In last week’s Friday Fish Sticks feature at OwlJones.com, Owl posted a link to a video of a robotic fish and speculated about the potential of expensive, robotic lures. I’m sure there are self-propelled lures out there and I have no doubt that, with the advances in polymers and nano-technology, it won’t be long before we can get rid of all our complicated gear and use tiny cameras to guide a lure into the mouth of a fish, flip a switch and command a tiny motor to tow our quarry to shore for us. No robotics here. A plastic case, with a battery, motor and little propeller to drag your lure further out than you can cast because we all know the big fish are always just beyond our casting range. I’ve seen modern variations on this theme, but these days the tech-savvy anglers use remote radio control. Then again, why spend half the day trying to steer a rudderless plastic box through the weeds and rocks when a Krafty Fish Caller will have fish racing in from far away, just “begging to be caught.” Twelve fishermen (not just a couple), outfished by a kid with a bee in a jar and what do they decide they need? A hermetically sealed case with an electric buzzer inside! No more need for careful observation or bee-catching skill to fill that frying pan! And as long as you’re enjoying the modern conveniences of battery-powered lure delivery systems and electric dinner bells to hook fish, why not take it one step further and do away with all that pesky cranking once you have a big one on? 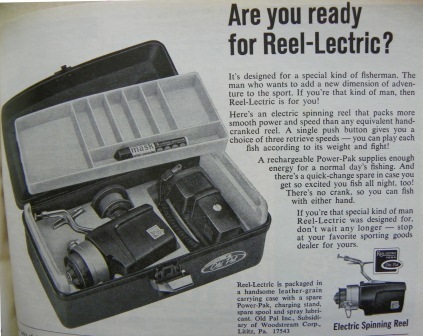 The 1967 Reel-Lectric was designed for a “special kind of fisherman” and, with no crank, those “special” guys could fish with either hand! 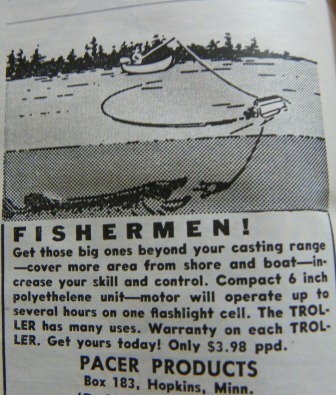 They could fish all day with the rechargeable “Power-Pak” before popping in the spare to fish all night, too! Thank goodness for all those good folks out there, always coming up with ways to make our fishing more enjoyable by taking away the guess work and tremendous muscle strain we put ourselves through, season after season. That first ad is hilarious. I mean, he’s in a boat. Casting range? Just move the boat! 🙂 While I realize that it might be a matter of not spookin’ the fish with a boat, the ad doesn’t cover that! Ahhh…it was a simple time I guess when simple sold. eliminate all that stuff with lures from DuPont, just make sure the fuse is water-proof.